Drink a Toast to Death! Take a spurned sweetheart, a former girlfriend, one love rival, two bottles of beer and a revolver, and you have the recipe for an evening in hell. Frances Curnow was at home with her new beau Edward Teel when there was a knock at the front door. Edward went to answer and found that he was staring into the business end of a revolver held by Frances’ former flame Russell Bishop, a Signal Hill oil worker. The oil man wasn’t making a social call, he was bent on revenge. He barged through the door and then forced the frightened couple into his car at gunpoint. He told them that he was going to “take them for a ride in the country” and then kill them. With the muzzle of Bishop’s revolver pressed against the back of his head, Edward drove to a secluded place, stopping only once to buy some beer. When they arrived at their destination the gunman made the couple get out of the car. Thrusting a bottle of beer into Frances’ trembling hands, and then he handed another beer to Edward. 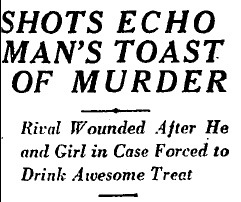 “Drink and be merry, for tonight you die.” With that sinister toast, the apparently doomed lovers drank their beers. The rejected swain then tried to compel his victims to embrace each other in a final farewell. Frances refused, and Bishop began firing – wounding Edward in the abdomen and the leg. Leaving Edward in a pool of blood, Bishop vanished into the night. Supporting her injured boyfriend, Frances managed to get to the side of the road. Detective Sergeants Kirkpatrick and Blunt were transporting a prisoner from Pomona to Long Beach when they caught Frances in the headlights of their car, waving and pleading for assistance. She was sobbing hysterically but otherwise unharmed. Edward was rushed to Long Beach Hospital where he is said to be recovering. Bishop is believed to have driven to a lonely spot and committed suicide.